Trust in a relationship isn’t just about answering the question “will this person cheat on me?” Trust is also about whether a person believes that his or her partner will provide experiences that reflect back a sense of self worth and interpersonal value. As stated previously, each interaction is an opportunity to show concern and love or to express apathy or resentment. Whether we know it or not, we are in constant communication with our partners, continually reflecting back messages that may remain only subconscious to us but are entirely felt by the person to whom we are communicating. Trust, in this context, is a daily, conscious act. Initiating healthy conflict, bidding for attention, and sharing an important experience, all require vulnerability. Therefore, trust is incredibly important in a marriage. 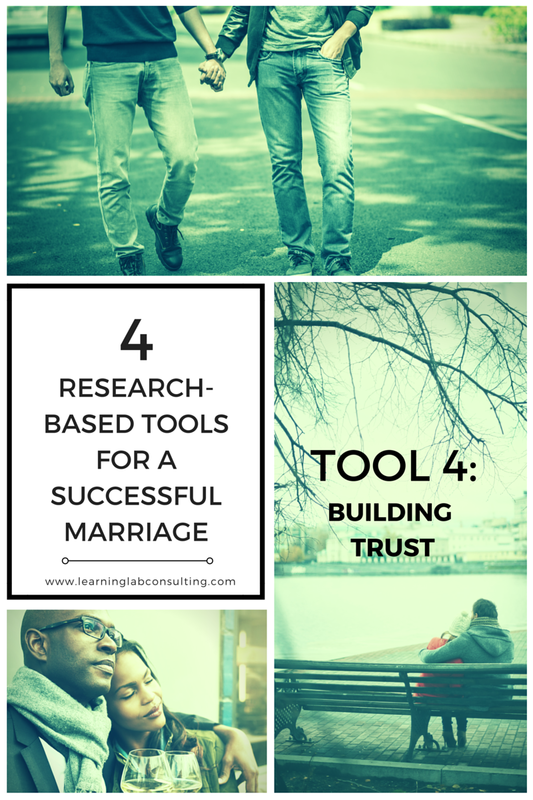 In fact, marriage expert John Gottman’s research shows trust is one key to healthy partnership. According to an interview with Gottman on UC Berkeley’s The Greater Good website, there are even health risks in untrusting relationships. In marriages where there is a lack of trust, men are likely to die earlier (for complicated reasons you can read about in the article). Gottman continues, “… how do you build trust? What I’ve found through research is that trust is built in very small moments, which I call ‘sliding door’ moments, after the movie Sliding Doors. In any interaction, there is a possibility of connecting with your partner or turning away from your partner.” This goes back to the idea of “bids” discussed in “Scanning for Positives and Affirming Successes.” Each interaction is a chance to affirm or deny a partner’s value. Can a partner be trusted to affirm one’s worth? Is there the chance of denial and rejection in this interaction? According to Gottman, the answers to these questions are key. Each micro- interaction is building a larger message, a “meta-communication“, to one’s partner. In accordance with this, Gottman cites research from Yoshimoto that created the acronym: ATTUNE. Again, affirming experiences and emotions and responding in understanding and kindness. It isn’t anything groundbreaking, but it is much harder to do in practice than in theory, and for me, reminders are helpful. In the article, Gottman also states how destructive the “I can do better” impulse is. Basically, the moment one thinks about getting out the relationship, commitment disappears. A part of that person is already gone, looking toward a future apart. Of course, one can’t always know a relationship will work, and to expect that it will might be unreasonable in all situations. Taking out the option of the “better” that lies elsewhere, however, can help to be in the present moment. In addition, it builds trust when both people are fully “present” in the relationship. Affirming one another’s successes is just as important as the way a couple handles conflict. Celebrating a partner’s accomplishment can pay back major dividends and ignoring them or reacting negatively can do real damage to the relationship. Trust is built through all of these processes. Each moment is an opportunity to affirm one’s partner and their commitment to the relationship (or not). In addition, commitment is about the little moments and the big picture; being “present” in the relationship instead of mentally escaping builds trust. This research does not describe every possible problem or every solution available to married couples (obviously), but it might be some good food for thought. Whether a couple is already happy and functional or whether they are attached by nothing but a thread, I believe that growth is always possible. This post is part of a series on marriage where I explore the topic as a personal and social experience. Thoughts? Opinions? Connections? Please share.